This talk takes the audience through a complete Continuous Integration\Continuous Deployment (CI\CD) process. CI\CD concepts will be demonstrated in real-time during a live coding demo of a simple application, unit test and a CircleCI configuration file. Continuous Deployment will also be demonstrated via the CircleCI configuration file. At the end of the demo the app will be live and functioning on a cloud server which will Digital Ocean. The goal is to show the audience how to implement CI\CD into their development processes with ease and unravel the CI\CD mystery. 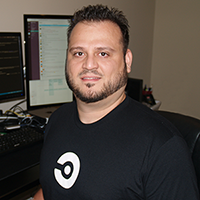 Angel started his career as an US Air Force Space Systems Operations specialist in Cape Canaveral AF Station where he discovered his passion for technology and software development. He has extensive experience in the private, public and military sectors and his technical experience includes military/space lift operations, software engineering, SRE/DevOPs engineering. He also has a wealth of experience in defense and federal sectors such as contracting, information systems security and management. Angel’s passions are positive disruption, learning, teaching, mentoring but most of all inspiring all forms of technologists & building awesome tech communities.